With continuous advancements in mobile technology, it is becoming increasingly beneficial to have a mobile website for your business. A standard website may work on different devices but websites not developed to be mobile-friendly may steer customers away. Poor usability on website not formatted for mobile use might display text that's hard to read or integrate a navigation system that's a hassle. CIRTA.us is an example of a user-friendly mobile website we recently re-coded responsively for better mobile presentation. On the left is their previous desktop site squeezed into a mobile screen--it looked fine but was difficult to read, click, or find information. 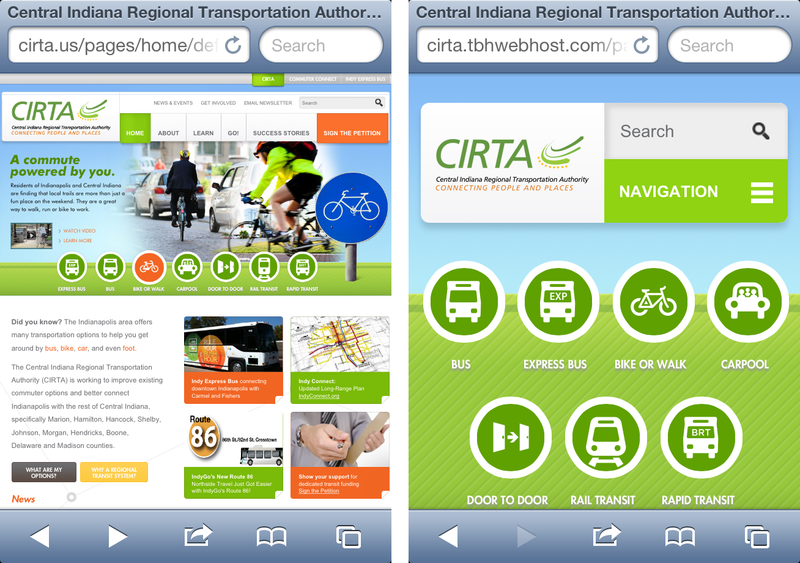 On the right is their revised responsive mobile website which offer big buttons and clear options. TBH Creative designs and builds user-friendly websites. Contact us today to get started planning how to make business website mobile-friendly.